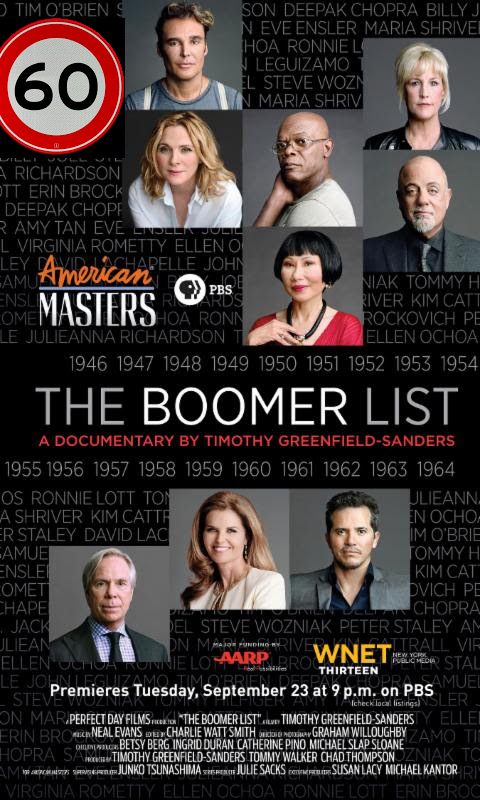 Disappointment abounds around Going Like Sixty… that I wasn’t asked for my opinion about The Boomer List premiering Nationwide Tuesday, September 23 on PBS. Interviews by filmmaker/photographer Timothy Greenfield-Sanders (The Black List, The Latino List, The Out List) focus on these individuals’ exceptional achievements, struggles and identities, sharing the experiences of these extraordinary Americans and the history they lived through and often created. Subjects illuminate the key movements and changes that shaped the world during the baby boom years, discussing the environment; arts and entertainment; science; civil, LGBT and women’s rights; law; politics; public service; sports; the military; technology and media. says Greenfield-Sanders, whose past films include About Face: Supermodels Then and Now and American Masters – Lou Reed: Rock and Roll Heart. Apparently he didn’t think enough of the generation to interview a plain old boomer… like say, MOI! says Michael Kantor, executive producer of American Masters. Yeah, we’ll see… you’ve been warned PBS American Masters.